Mezzanine Box Blue $ 5.65 2 lines separating Box/Seat sections. Scarcest variation. 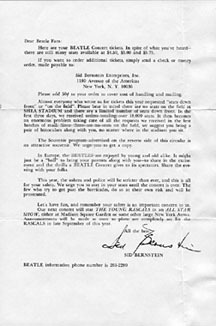 A new world record for a pop concert was created when more than 55,000 fans attended this legendary outdoor concert at Shea Stadium, and the Beatles also set a world record with their $160,000 share of the $304,000 gross receipts. The show was filmed by Ed Sullivan Productions for a 50 minute TV special that the BBC first aired on March 1, 1966. 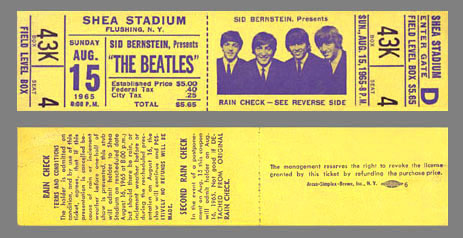 Very few unused 1965 Shea tickets have turned up over the years. The blue Mezzanine Box, Upper Box and Loge Box unused tickets are especially scarce. 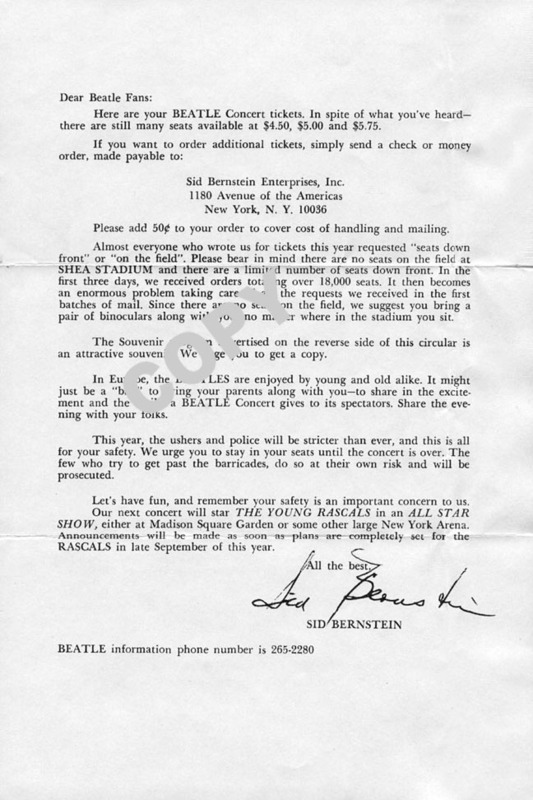 A two-sided letter sent out with orders of Beatle tickets for the Shea concert. The front is a "Special Offer" for "The Official Beatles Autographed Picture Book and Official Program", and the back is a letter from Sid Bernstein telling about the concert and how to order additional tickets. 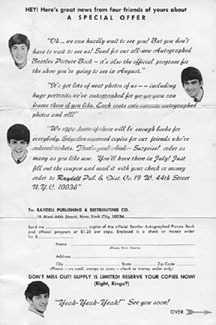 A similar flyer was also sent out in 1966. Both letters are extremely rare. Click on either image for enlargement.